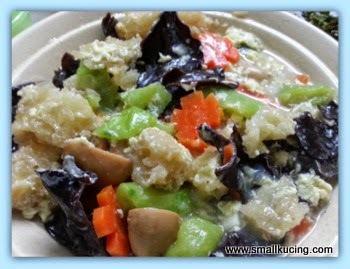 Some time ago, Mamarazzi saw Sonia blog "Claypot Luffa gourds, Black fungus and Fish Maw 胜瓜云耳浸鱼肚". 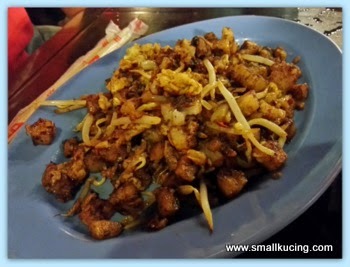 Seeing that we have some fish maw given by Ah Mah during Chinese New Year, Mamarazzi pun attempt to make the dish la. The Fish Maw must have been kept too long coz it had "oil" smell. Rinsed many times with hot water still have the smell. Pakai hentam la. Too bad Mamarazzi didn't have sole fish. Guess she just have to make do with ikan bilis la. 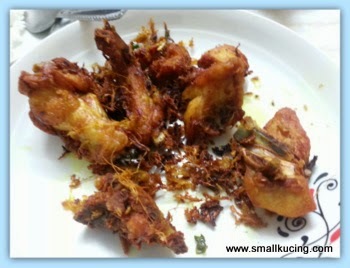 That night syok lor.....I get to have my Ayam Goreng Kunyit. 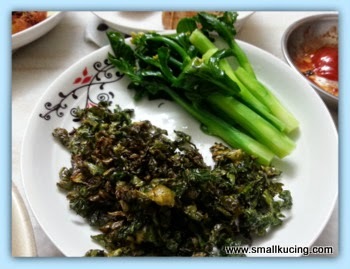 And this funny dish....fried and blanched Kai Lan. Mamarazzi thought I would love the fried "leaf" but sorry, I didn't. 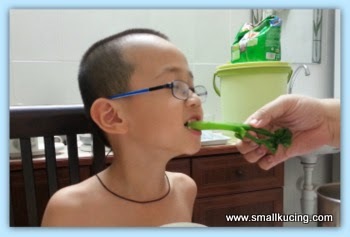 Instead, I love the crunchy stems.....I can just chomp chomp chomp like a rabbit. This is not my first visit to raya open house but it was quite some time ago that we went to one. This is my first time going to Auntie Azila's new house. The ghost of the teachers came back to haunt them. It was very scary leh. Mamarazzi can see me shivering watching that. Scared but still wanna watch....errr.....I didn't really noticed how the food taste like coz eyes were glued to the TV. Lucky for me,.....that night no nightmares. Result of GIVEAWAY : Tricycle worth RM300 by The School ! 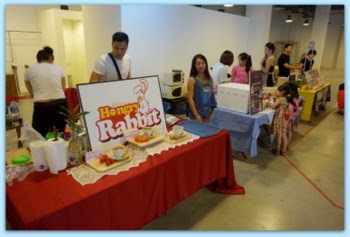 #Photos credits to Ms Sharon Kuan of Jaya One Management. 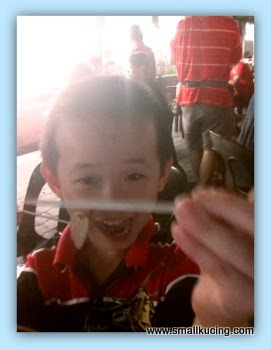 Did you went and have fun at the "Sun day Out" organised by The School, JayaOne? Did your kids meet the friendly clown? How about the food there? Not only indoors...outside there were food trucks too. Okay...here is the moment that you have been waiting for. Thank you to everyone who join the contest . I love to chill out at The School at Jaya One as it is near my home and the whole building's layout concept is modern & exciting. This is definitely a wise event to organise the "Sunday Out" which would benefit both the parents and kids tremendously. The kids would have lots of fun riding indoors in a safe environment while the parents could relax and have a peaceful mind on Sundays besides giving their kids the chance to enjoy and learn to ride in safe manners. 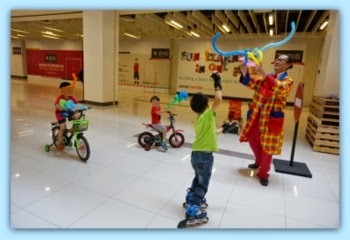 The organisers are so generous to give away a handsome and cute bicycle which would excite and make all kids happy! How nice if they could also invite the orphans and under privileged kids from homes to enjoy on all Saturdays. Those poor kids are often sadly holed up at their charity homes with no outside excursions and outings as they have no parents. They only rely on the public and kind samaritans to bring them out. I have also clicked "LIKE" on both the Facebook links of The School Facebook and Jaya One Facebook. You have the name of my Facebook! Message from Mamarazzi : Congratulation to Twilight Man You have moved us with your reason and generousity. We hope the orphanage will be very happy with your gift. For those of you who have join but did not win, don't give up. 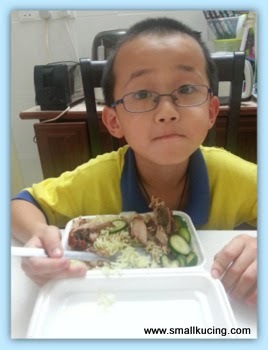 Hop over to Isaac Tan's blog as he is having the same giveaway. Good luck. 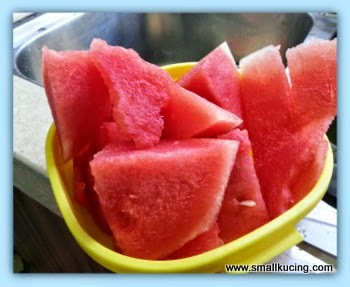 After cutting the watermelon, there is always some odds "shape" that just couldn't fit into the container to be put into the refrigerator. Usually , Papa and me would eat those but sometimes it's just too much. 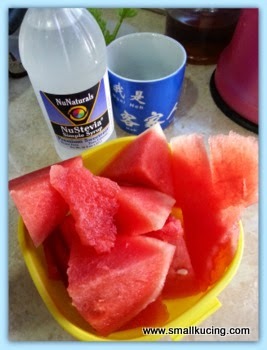 Well, since we have a bottle of NuStevia Simple Syrup, why not try make watermelon sorbet. 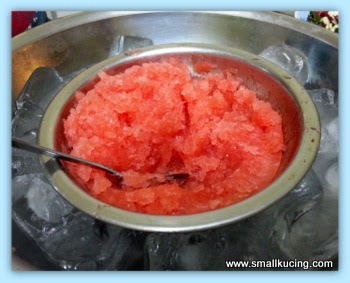 Very soon.......yummy sorbet is done. Hmmm.....lemme taste...hmm....not as sweet as the ones she bought from the store but Mamarazzi said too sweet is not good for me. Well...guess this will do. Mamarazzi have been seeing a lot of this Taiwanese dessert online lately....It's ice cream in a flower pot....they usually stuck a flower on top to make it look like a plant. She thought it would be nice to make this for my Funland Class but how ah....Ice cream will melt in no time. 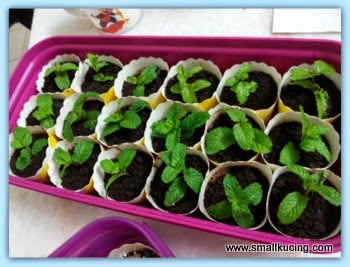 If use cupcakes, the cake may not be moist enough to keep the "plant" alive as she was planning to use mint. We have loads of mint. 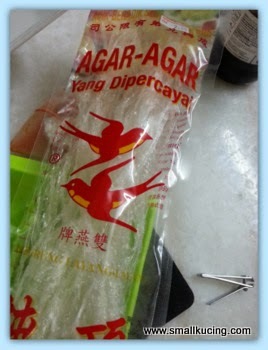 Okay la....hentam...try use "agar-agar"(jelly) la. 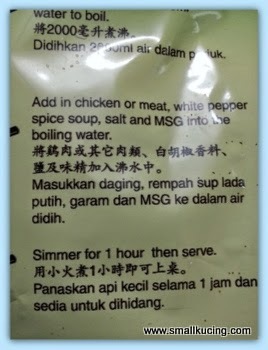 Bought a packet and boil. How much water....errr....just "agak-agak" (estimate) lah. 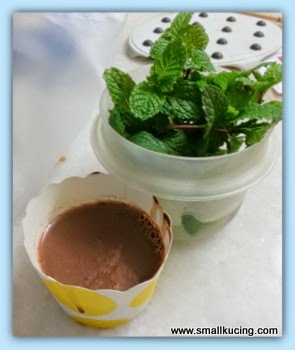 After all the strands of jelly melted, add in the Milo...also "agak-agak" to taste la. 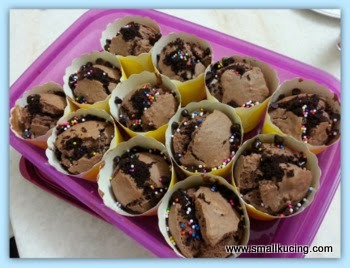 then pour into cupcakes cups...put into the fridge. 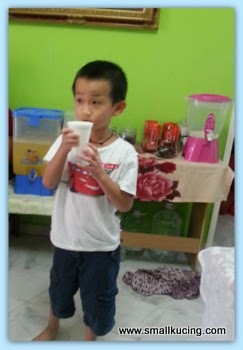 Next morning before going to Funland class...took out from fridge and "decorate" it. 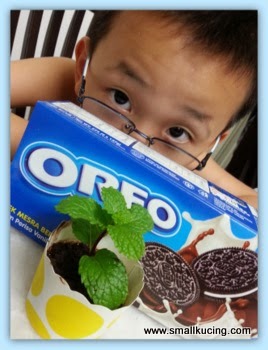 Put in the "soil" and "plant" the mint into the pot. 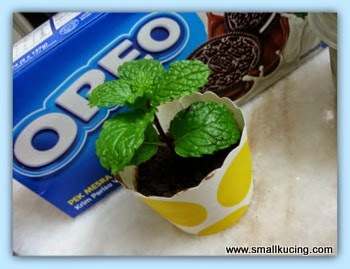 Don't you think it look just like a potted plant? Cupcakes?Errr....plan B ma...just in case they don't like the Mint garden. papa had a meeting to attend to. It' was nearly lunch time. No time to go home and cook. 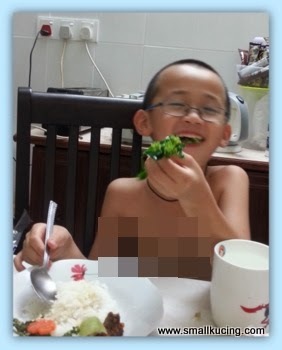 Mamarazzi said just "Tapau" lunch la. Papa likes the Mixed Rice from Restaurant Unlimited in Subang Jaya. Mamarazzi dunno what to eat. Then saw this stall at the restaurant. The "light bulb" blinked. Auntie Fay mentioned before the Roast meat here very nice. 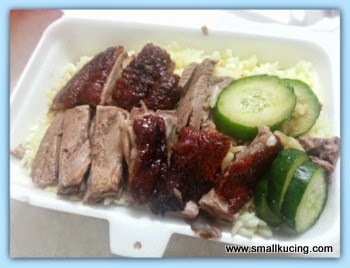 But dunno why Mamarazzi end up buying roast duck rice instead of roast meat rice. 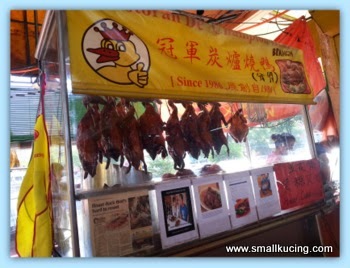 Very generous portion of roast duck. 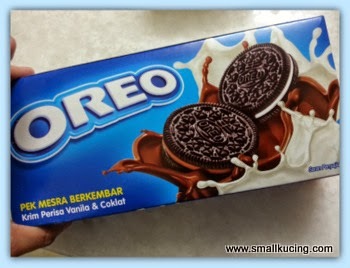 If not mistaken the price was RM6. ....Mamarazzi old already. Not good with numbers. Mmm...quite good leh. 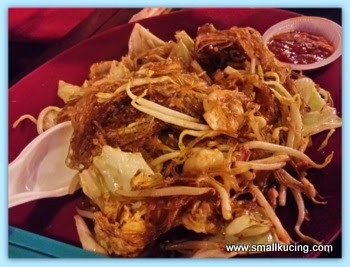 I would love to eat this again...but this time maybe try out their BBQ pork .. I was very hungry after the visit to the temple. Beh tahan. Papa stopped the car at one of the petrol station and Mamarazzi bought some bread for me to eat Papa's friends also offered me some spicy keropok. Yikes! 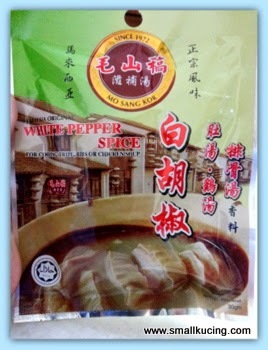 spicy leh....but but but....spicy I also hentam and eat la. Where to go for dinner? 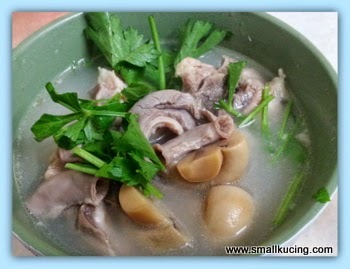 Initially, Papa's friend want to have Bak Kut Teh coz it was such a cold day but one of the friends doesn't take pork. Called up the usual BKT shop that we went to. They don't have Chic-kut-teh. Last last...detour to Kepong There got food court. 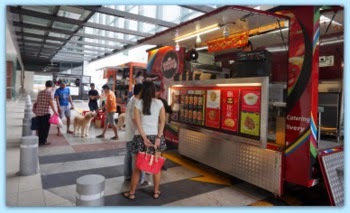 Each can order his/her favourite food. 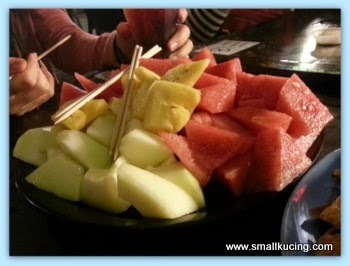 One big plate of fruits. Papa ordered Fried Carrot Cake for his friends to share . Just for the taste. For himself...he had the fried Tang hoon. Mamarazzi was cold. 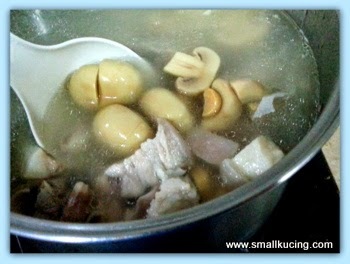 Though ...okay order Boiled Soup la...but that stall was not opened....then went BKT stall...also not open...No luck . Lucky for her the Fish head noodle stall was open. 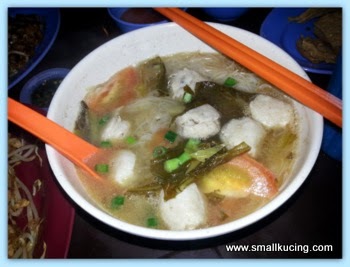 She ordered a bowl of fish paste noodle without milk. 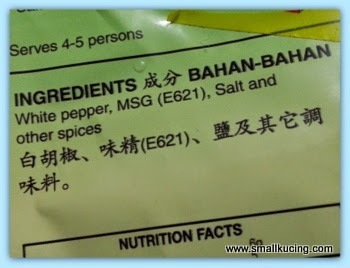 Hmm...very generous with the ingredient. 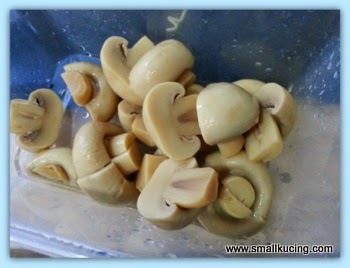 Price was RM5 or RM6. Can't really remember. 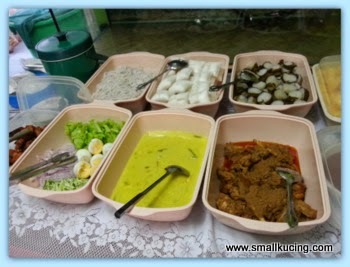 So far the food that we have ordered there suit our taste. As for papa's friends...they had the Portuguese Grill fish with rice. Not sure if it taste good for them or not as Mamarazzi did not ask. After Papa's friends had eye opening experience in Genting Highland Casino, we started our journey back. Nope..they did not gamble. . They went in and "look see". Saw saw some happy face and also one crying. They didn't have time to visit the theme park coz it was quite late. Wanted to get back to town before traffic jam. On our way down the mountain , we had a slight detour. Went to Chin Swee Caves Temple. Gosh...mamarazzi was amazed.So much have changed since the last time she visited this place...that was at least a decade before. Now there are very nice building there and vegetarian restaurant too. Hah? Snap photo ah? Make cute face? This one cute enough or not? Errr...Mamarazzi's "sick cat" face...started to fever coz kena rain. Which way now.....behind me seems to be many people....wondering what are they reading...maybe have map there. Again kena Mamarazzi "catch" to pose for photo. Along the wall at the hillside there were many statues. Saw it said something Lohan. Maybe 18 Lohan? Didn't count coz it started drizzling ....walk fast fast trying to see as much as possible before the rain come pour down hard. Up the hill seems to have various "caves" that depicting various Hell Chamber. It started with the registration office. Can read? Too blur or not ? Battery in the camera kaput-ed. Snapped using phone. According to the board "Qin Guang Wang of First Hell Chamber manages the book of birth and death of human realm, their longevity or a premature death. He centrally controls the penalties of human being's while in the hell realm. After death, a good person will be sent for rebirth to Heavenly Realm or Western Pureland of Great Bliss, while a person who had done equally virtuous and evil deed will be sent to the tenth Hell Chamber for rebirth to human realm. Those who had seriously committed unwholesome actions would be taken to the right chamber, to review his or her wrong doing and the penalties for that action." Quite interesting...We only managed up to the 5th Chamber of Hell when the rain start pouring down hard. maybe next time can go see. Hmm...not advisable for those who are easily scared coz some figures were a bit scary. Come on...let's run.........raining hard liao. Tak aci ni.....rain like wanna stop already pulak....errr.....next time bar continue the journey up the caves la. Mamarazzi said if she is not mistaken...behind of me are the statues of 8 Immortals who are famous for the story of 8 Immortals Crossing the Sea.